I'm really excited to begin this new chapter in my life. Readers of my blogs may see some design changes (starting today) as I reclaim and flesh out my ancient pagan Celtic heritage in a more deliberate and focused manner than I have in the past. 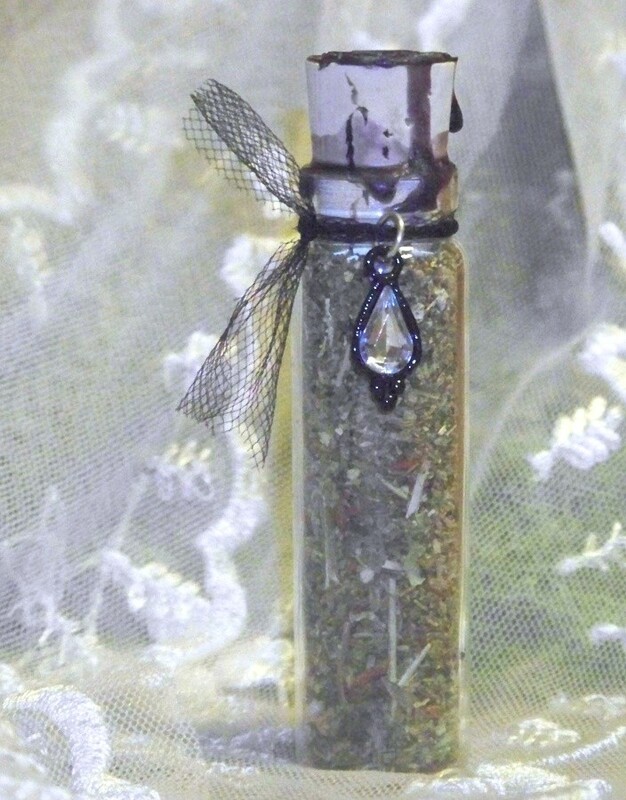 Witchcraft has brought spiritual healing into my tattered life over the past several years, and now the specific Goddess focused Avalonian Tradition of Witchcraft will bring healing out even more fully. While I recognize the parallel importance of a Divine Masculine path, the path of the Divine Feminine is the way for me. Blessed be my Ancestors for bringing me to this day. Commentary on Vayeshev from Garden of the Dark Moon Jubilee - The Sacred Land's Green Mantle. Myfanwy pronunciation: Listen and hear how to pronounce my Noble Name "Myfanwy" in Welsh forvo.com/word/myfanwy/ . My seventh grandchild is on the way! My youngest son and his long time girlfriend are expecting their first. Goddess bless this child with all goodness, that s/he be born healthy, happy and enveloped in love. I feel my good work is vindicated now (after this nursing facility fired me this past August 2nd for refusing to discipline one of my union restorative staff without written policy support) after I worked so hard to drive their total Medicare-A reimbursements up 40.2% during the first full quarter of my employment there. Now, and I quote - "After a series of months in the black, finances at the Champaign County Nursing Home have taken a turn for the worse ..."
URBANA – After a series of months in the black, finances at the Champaign County Nursing Home have taken a turn for the worse. But the facility is still about $100,000 ahead for the year, the county nursing home board of directors learned Monday night. August and September turned out to be tough months for the county-operated facility, with a loss of about $24,000 in August and another $15,000 in September, according to nursing home director Andrew Buffenbarger. That came after three consecutive months with net income of $66,191 to $91,766. August originally was in the black until officials discovered that not enough money was being deducted for retirement expenses. All of the mid-year correction of about $47,000 was taken in August, resulting in a loss for the month of $24,000. The loss in September was attributed mostly to pharmacy costs and higher than expected staffing costs. Their census is down too, making it even worse. I finished up the process and received my Certificate of Business Ownership for WITCHCRAFTS by Liorah Lleucu today from the County. For only a few bucks, I've also purchased some promotion spots on Etsy for my shoppe over the weekend and on Cyber Monday. I hope it pays off. I have bills to pay. I am really hoping to get some new cool candles listed before the promotion begins too. I wish my supplies would hurry up and arrive - I've got some really neat plans for some awesome candle designs! Commentary on Vayishlach from Garden of the Dark Moon Jubilee - Lilith. My stress level has just plummeted. I just finished talking to a very nice lady agent at the Illinois Dept. of Revenue and found out I only have to collect and pay sales taxes on sales shipped to customers living in Illinois! That makes things so much easier. My tax bill is also going to be so much cheaper than I thought as I have had only a handful of Illinois customers at most for all of 2009 and 2010 to date! The rest of my sales receipts (the vast majority) can be deducted via the interstate commerce deduction allowance. I'll probably owe less than $5 in sales tax when it get it all figured. I've also ordered Deduct It! Lower Your Small Business Taxes for use when figuring my income taxes for 2010. I'm trying to figure out how to pay my sales taxes and I definitely need to take a brain break right now. They didn't send me any preprinted ST-1 forms so I could file for the early months of 2009 since I can't file those online. One of those quarters I had only $9.50 in total sales - doesn't seem hardly worth filing for, but alas I must pay my 59 cents or so for that quarter, so they should have sent me some forms to file with since they don't have the forms available online and the option to file for those quarters electronically isn't available either! They want people to pay their taxes, right? So, why do they not give you all the stuff you need to do it right off the bat? I need them to verify my sales tax rate is correct too. They should have provided me with this information I think. I'll work on this some more tomorrow when I can contact someone for answers and forms. I'm finished with it for tonight. Last night I dreamt a dream with three sets of threes. I was in a fancy restaurant with a bar along one wall. For some reason, I was asked to and did point out three bottles of liquor from among many I was shown that were especially magical. One among the three I chose was especially especially magical, and I designated it as such. The three liquors I chose were classy liquors although I don't know now specifically which ones I picked out and designated as especially magical. In the background, someone was trying to make trouble for me there, so I left and escaped the trouble in my black car which someone was trying to steal. Arriving at another nice restaurant, I got out of my car and walked into its foyer. It was shabbat and people were crowding into the restaurant around me for dinner. On a shelf overhead, someone requested that a reserved box of three especially magical liquors be brought out to celebrate shabbat. The three special liquors in the special reserved box were the ones I had just chosen in the first restaurant, the very very magical one among them especially caught my eye. There were three people standing on the Temple Mount Stonehenge Land - the Land was elevated upon a mystical hill - two men and me, a woman. There was no Temple building or standing stones there on the Land, it was just the Land upon we stood. We were going to do a magical operation whereby cosmic energy would be directed. Each one of the three of us standing on the Temple Mount Stonehenge Land walked a circle like an orbit around some empty central point. I walked an orbit between the orbits walked by the men. I walked my orbit widdershins. They walked their orbits in the direction opposite mine. This was the way the magical operation was implemented. Commentary on Vayetzei from Garden of the Dark Moon Jubilee - Ancestral Ladder. Commentary on Toldot from Garden of the Dark Moon Jubilee - The Red Meal. This evening begins astrological Samhain. Last evening and today is Shabbat Samhain. In observance of this shabbat sabbat, a sabbat shabbaton of the witchy kind, I ritually created a passage key link between this world and the Otherworld Mystery of Fate using the name of my ancestor and grandmother Evelyn (who has merged with the Power within the Land) to call upon the Goddess of the Old Ways (known in the ancient Celtic mysteries as Kolyo). The ritual itself, though undisclosed here, was exquisitely simple but perfectly focused. The molten innards of the Land were rising to the surface. Under my feet, everywhere I walked, the bright orange of rising lava could be seen under the dissolving membrane of earth which covered it. The world as I knew it was dissolving. I saw people falling into rivers and seas of molten earth as it rose to the surface. The surface under my feet was warming, and no matter where I went, civilization was being swallowed up in an ocean of lava. I was trying to find some place safe to walk upon, some place that would be spared being consumed by the rising liquid fire. Humankind, like in the mythologic flood of Noah's time, was being swallowed up. There was seemingly no way to escape it. Suddenly, in my mind it was spoken and made known to me, the only place to which I could flee to find refuge from the consuming fire of the Innards of the Earth, the only Land on the planet which would be spared, the only place where human beings would continue to exist, was in ... "the Colorado mountains." Then, as I was hurriedly moving from area to area of quickly dissolving Land (as soon as I stepped off any area, it fully collapsed into the emerging ocean of molten earth), I saw it - the remnant of humanity, with me among it, living safely in the Colorado mountains. Then, I woke up from this particular dream. The Colorado mountains? What can this mean? Kolyo is the Divine Name of the Great Mother of All - Ubiquitous, Omnipresent, Immortal and Eternal. In Indo-European Paganism and Celtic tradition, Kolyo is She who drives the Divine Drama and gives birth to the Gods and Goddesses. The Supreme Spinning Goddess, She is the First Timeless Source who regenerates All. A Being and Power older than Time itself, Kolyo spins the threads of Fate. Raidho is the rune of Divine Law, of the Old Ways, of travel and movement, of the journey of the Soul and Spirit throughout the tapestry of time and timelessness. It is the path upon which Being walks, and all my paths lead to Kolyo Raidho, the Witch who contains both upstairs (in the Overworld) and downstairs (in the Underworld). In parallel, the 'mountains' of kolorado are the three Goddess letters 'y' (yud, י), 'i' (yod, י) and 'h' (hei, ה) in the Divine Name 'Kolyo Raidho.' These three letters (ייה) permute to form the Divine Name Yihye (יהי, meaning 'to be', 'to become', 'exist', 'happen') of Jewish tradition (where my own existent physicality forms the final ה of the Name Yihyeh (יהיה, the Divine Feminine Tetragrammaton) also meaning 'to be', 'to become', 'exist', 'happen'. 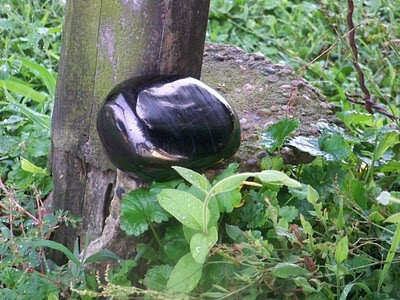 Through Goddess the Land speaks. In Goddess the Torah's sayings are sourced, for ultimately, they are Her words. Safety for me exists in and all my paths lead to the Old Ways of Goddess. More good news in follow-up to my entry Upright and Just, where I considered the ethical issue I am having with a witch who is trying to claim I infringed upon her copyright by making and selling a drippy black pentacled pillar candle in my Etsy shoppe WITCHCRAFTS by Liorah Lleucu. Well, I turned her in to Etsy after she sent me a certified letter advancing her threat to sue me for copyright infringement if I didn't stop selling my candle. With copyright law clearly on my side (I in no way infringed upon any copyright as she is trying to claim), and given that she is the owner of candle company with legal counsel available to her, her legally unfounded claim makes her threat to sue me abuse of the legal system to conduct a campaign of slander and harassment. She also has been harassing me via email, and apparently has been slandering me and trying to stir up trouble for me using Etsy forums. No copyright law had been violated. That having been told not to contact me any further, any further contact this witch may try to have with me is a violation of Etsy policy and I am to let them know if it occurs, in which case, she may be banned from doing business on Etsy. That she is not to slander me or my shoppe any more using the Etsy forums. Hey, hey! I received my Illinois Business Authorization and Certificate of Registration today for WITCHCRAFTS by Liorah Lleucu! I have an official business tax ID number now. I think this also means that I can now buy my craft supplies wholesale too! It's expensive to make craft items when you can't get wholesale supplies. Now, if I only had the money to buy some wholesale supplies .... in time, in time. I have patience, even if I am very excited to get started. In follow-up to last week's entry Transitioning From Hobby To Business,where I registered WITCHCRAFTS by Liorah Lleucu with the state, this past Monday I took the next step and registered with the County, filing an Assumed Name Certificate Intention. Tomorrow, the local newspaper begins running my Assumed Name Publication Notice in the legal section of the newspaper. I'm now waiting for tax filing information from the state to get my business taxes in order. Next on my list ... to find out about business tax deductions and how to deduct my start-up costs and other expenditures, and how to put together a small business-wise bookkeeping system. The box under my desk with all my receipts and other documents still waits for some organization ... but, at least I'm on my way. Commentary on Chayyei Sarah from Garden of the Dark Moon Jubilee - The Thin Veil. Well, I did it! Yay! I really want to make this go while I have the opportunity. This is my chance to do it. Oh Goddess, make it happen! I've started the transition of my witchcrafting from hobby to home-based business! I just got through filing an application with the state of Illinois to register WITCHCRAFTS by Liorah Lleucu as a business and to get a business tax ID number. This year I've had enough sales to make it worthwhile to at least try to grow WITCHCRAFTS into a full fledged business. I am so excited, but a little bit intimidated about trying to figure out all that is legally required of a business. So, I bought "Home-Based Business For Dummies." I need to get it figured out by April 15th for sure. I need a bookkeeping system too. Right now, all my receipts and records are in a big box under my desk. That is not going to work at all if my sales really start taking off. I've got to get this organized or I may go insane. 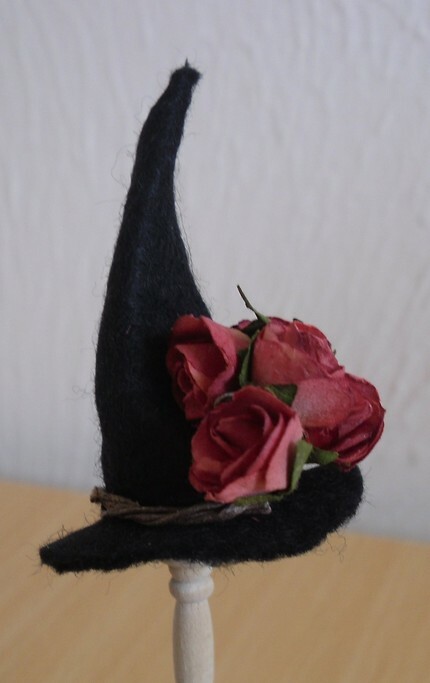 I think I also may have to register WITCHCRAFTS by Liorah LLeucu (my "Doing Business As" name) with the County Clerk too, so that is next on my 'to do' list. Then, I'm going to create a business logo, and as soon as I get the money, I'm going to Trademark my business name. I wonder how much it costs to do that? Anyone out there know? 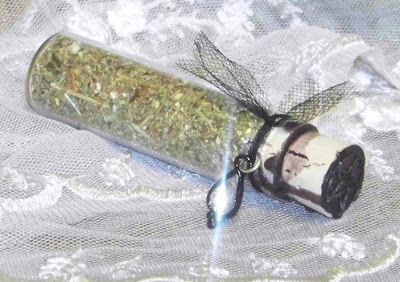 "Arrived quickly, beautifully packaged and obviously potent! I couldn't have wished for more. The depth, scent and beauty of the item is outstanding." "I absolutely LOVE this! So cute and beautifully packaged!" "Way beyond expectation, Love your shop - thanks so much!" "Wow - these are fantastic! amazing scent, very special set. Will be back!" "Awesome candles! Most impressive, and wonderful additions to the holyday to come." "Beautifully packaged and sent like a gift more than an item to be purchased. Product is subtle yet powerful." "I cannot rave enough about Lori and her products. Truly magickal, both of them." "So good to find the 'real thing', it is so rare.."
"Gorgeous. LOVE your packaging, like opening a gift to ones self." "I'm stocking up before others find these. I'm completely being selfish. WE LOVE THIS CANDLE." "I HAD to have this." "Absolutely GORGEOUS! It was beautifully wrapped, (the cinnamon piece was a nice touch) and came quickly and in great condition! The crystal is also wonderful, and the piece itself is my favorite chord now. Very very good." "Truly, one of a kind. A true Witch who creates true products... no 'assembly line' feel, which is magickal in itself." "My Genuine Wolfsbane Talisman Pendant is beautiful! It is absolutely perfect! I love it!" "Awesome item, super fast shipping, and wonderful to deal with!" "The smudge wand is simply perfect!" "Another great product. You can always count on Liorah for superb quality and service. I am a repeat customer and will be back again for sure." If you haven't checked out WITCHCRAFTS by Liorah Lleucu, you don't know what you're missing! Commentary on Vayeira from Garden of the Dark Moon Jubilee - Upright and Just. I had a rather unusual dream last night. 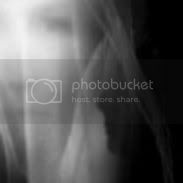 In the dream, I was not in my physical body even though I was in a type of astral dream body that had a form similar to my physical body. I knew I was not in my physical body, which was laying like an empty avatar in front of me. I was 'making repairs' to my physical body - specifically, I was painting a coat of clear polish onto the skin of the tops of both my shoeless and sockless feet. Looking for cuts or abrasions or other imperfections to fix, I saw none. The only thing I needed to do, I did - which was to put on the clear polish. Finished with the polishing, I had a curious idea. I wanted to see if the astral body I was in could feel it (in my astral body's big toe) if I (with my astral body fingers) pinched the big toe of my physical body. I wondered. I decided to experiment and put the idea to the test. With the right hand of my astral body I pinched the left big toe of my physical body. Nope - my astral body's big toe didn't feel the pinch. That question answered, I took off flying through the place I was in - because, even as my physical body lay grounded, in my astral body I can fly! - weeeee! Commentary om Lech-Lecha from Garden of the Dark Moon Jubilee - Experiencing Another Being. Commentary on Vezot Haberachah, Bereshit and Noach from Garden of the Dark Moon Jubilee - The Spirit of Understanding. My oldest son is having spinal surgery tomorrow. I ask all my friends and readers to please say a prayer or healing spell for Jeremy - that the surgery go well without complication and that full healing comes to Jeremy, completely and speedily. WITCHCRAFTS by Liorah Lleucu is being promoted in a Samhain Giveaway at Love of the Goddess. 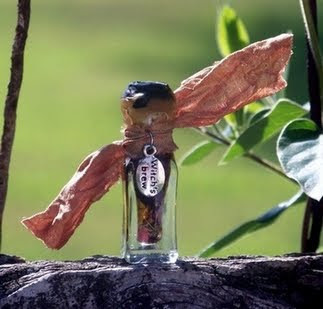 I've donated one of my DARK HARVEST Samhain Ritual Oils. Check out the link and read Tara's interview of me as the owner of WITCHCRAFTS for the Samhain giveaway-promotion. I'm getting so good at making candles! I've perfected the wick size (still using pure cotton) and just look at a picture of this latest one of SALEM - isn't it just absolutely gorgeous? Commentary on Ha'Azinu from Garden of the Dark Moon Jubilee - Kindred. May all my family, friends and readers be inscribed and sealed in the Book of Life, find deep and lasting joy, and be Divinely blessed with all good on this New Year. Well, I've lost more weight since I last weighed myself - over 10 pounds more! Yay! I've altogether lost 50 post-depression pounds and can get into this gothic witch skirt now. Success! I've achieved my goal ... now I have a new goal. This is definitely a good way to start the New Year! 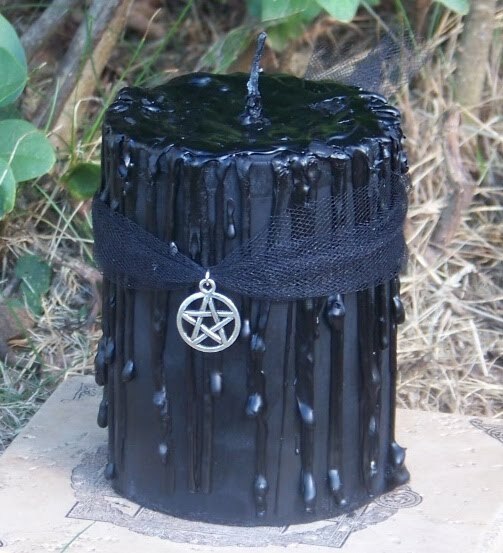 Well, I think I've finally got a good ratio of black dye to use in my handcrafted SALEM black soy candles (soon to be available at WITCHCRAFTS by Liorah Lleucu). Let me tell ya, soy does not take color as readily as paraffin. I also think I've got a good fragrance ratio for the blend of Dragon's Blood oil I'm using to scent it - it was actually a bit tricky to make the fragrance I wanted. I'll know for sure in a few days when I do the burn test (after the completed candle has cured for 48 hours) if I'll have a good scent throw using this blend and amount. Did you know soy has memory? I do now. I'm still working on an optimum wick for my smallest size SALEM black pillar (2" x 3"). After the burn test, a judgment will be made as to if I've found the right one to complement all the ingredients I'm using in this candle. Captain's log note - I've mastered the art of pouring! Yay! I feel like I've turned my bedroom into a scientific laboratory with all these experimental notes I'm putting into my Book of Shadows. Yes, I've set up my candle making paraphernalia right in my own room with a little table and all. This way I can work on it any time I want to. A good black soy candle is pretty hard to find commercially - one scented perfectly with Dragon's Blood is impossible to find. The end result of my experiments will definitely be worth it. Next up, I may start my experiments with hand dipped tapers. Do you know how much fun candle making is? This is great! I'm going to be a real chandler. Commentary on Nitzavim-Vayeilech from Garden of the Dark Moon Jubilee - The Lord's Frustration, The Lady's Understanding. Ooooh! Ahhh! Look what I found at the second hand store! One woman's trash is another woman's treasure! My magic candlesticks (with hand dipped red spell candles in them). 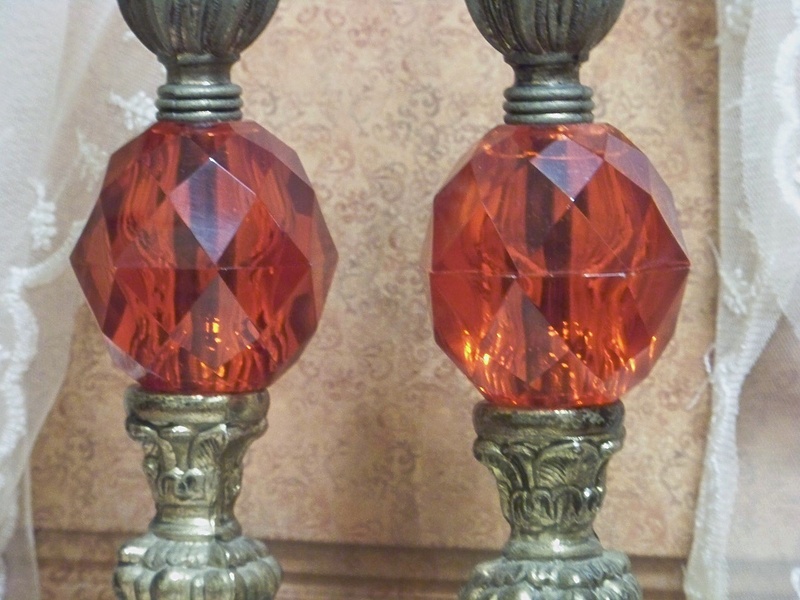 These vintage candlesticks are so ugly, they're beautiful - it was love at first sight! I'm smitten and adore them so much. I paid next to nothing for them too - isn't that extra great?! These magic candlesticks were made for this witch, for sure, for sure. These are just the best! The light reflects through the faceted red glass spheres like there is fire inside them! Oh my, oh my - I'm in witch heaven! Oooh! Ahhh! 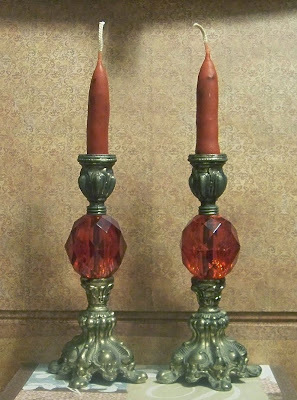 By the way, I will soon be selling hand dipped spell and shabbat candles (made with kosher wax) on my Etsy shoppe - WITCHCRAFTS by LiorahLleucu - check it out in a week or two! Commentary on Ki Tavo from Garden of the Dark Moon Jubilee - Unexpected Results. I didn't sleep at all last night. I finally was able to fall asleep and get a few hours of rest after sunrise this morning. Then, I dreamt. I was in a space station like chamber in outer space. With me there were two men. One was my friend. The other was like an evil wizard (who reminds me now of the wicked witch in The Wizard of Oz, only a male in this case). The evil wizard had brought my friend and I to the space station to steal the crown that only I could reach (just like the wicked witch wanted to steal the ruby slippers Dorothy wore in The Wizard of Oz). The evil wizard thought I was gullible like Dorothy and would just give the crown over to him as easily as Dorothy wanted to give over her ruby slippers to the wicked witch when challenged for it, so he had brought my friend and I there so that I could climb up the tower ladder that went up from the space station to bring down the crown that rested at the utmost top of it. I let him think I was gullible like Dorothy so he wouldn't interfere with my climb or hurt my friend as I climbed. But, I had no intention of giving over my crown to him. He wanted the crown so that he could rule the world with it's powers. It's my crown, and I'm going to use it's powers to enable myself to do my craftwork in peace. I'm like the evil witch who doesn't want to be bothered and to keep from being disturbed is going to buy a strong deadbolt for my door and a welcome mat that reads "GO AWAY." Anyway, as I was standing there in the space station chamber with my friend and this evil wizard, in my dreaming mind, even though there was no obvious symbolism to suggest it, I knew that this space station and the ladder with the crown on the top of it were in a mikveh. I'm not sure how the clear association came to exist (as I've only been to a mikveh once in my life), but there it was. Interjected here in the dream, between the mikveh association and beginning of my climb up the tower ladder, I encountered the space station dining room filled with diners, some cookies, a big dog running loose and some stairs. I took some cookies from the dining room (but never ate them) and avoided the big dog by taking a twisting winding chaotic path on the stairs between various floors of the space station. Then, I climbed the tower ladder and retrieved my crown, claiming it as my own as I touched it for the first time at the top of the tower ladder that only I could climb. The claim reverberated down and the evil wizard knew now that I'm not Dorothy and he was not in Kansas. I was crowned, and he can't have my crown or now hurt my friend now that I am wearing the crown. Suddenly, I was in my earth bedroom (as it appeared when I was a teenager) with some girlfriends. There was a terrible tornado directly overhead (the evil wizard must be having a fit, I thought). My girlfriends wanted me to get down on the floor so that I wouldn't get drawn up into the winds of the tornado, but I wasn't afraid. I had to get my earrings off the dresser top, so I stood up and got them. They thought I was crazy. But, I knew the winds of the tornado couldn't touch me, and I really wanted to wear my pretty witchy earrings, even within the midst of a tornado (witches are fearless like that, you know). So, I got them and put them on, then got back down on the floor along with my girlfriends. I woke up, having had only a few hours of sleep this morning. Last night, following creating CRYSTAL VISIONS Scrying and Divination Incense under the Full Moon (ב) during the planetary hour of Jupiter (ת), I dreamt. After returning home from checking on another woman's well being, I was in my house (which was also my place of business) sweeping my room (like witches do). My eye was caught by a movement of light and dark. I looked up toward the window. Even though bright natural sunlight filled the room inside, between the cracked open curtains at the window, I saw that it was completely jet black outside. It was so black outside there was a total absence of light, like reverse light - thick, opaque, impenetrable from the outside. It wasn't frightening at all. In fact, I felt completely protected inside by it - it surrounded my room, my light inside the room and me as I swept and went about my business in peace. As the photo demonstrated light-capture through the craft item and my dream further revealed it's connection to reality, it's clear that my handmade ritual incenses and other witchcrafts are not just crafty creations but are truly magical tools in communication with a unified multiverse. Commentary on Ki Teitzei from Garden of the Dark Moon Jubilee - The Mitzvah of the Twisted Cord. I was on a school bus sitting alone, near the middle but toward the front of the bus as well, in a seat on the right side of the aisle. Several others were on the bus as well, the females in the front of the bus and the males in the back. One of the guys came forward and sat down beside me in my seat. It seems we knew each other from some time in the past, from when exactly I'm not sure, but I knew it was true. We were beshert. After a few words together, we chastely kissed, sealing the fact that we were destined. Then, he moved back with the guys at the back of the bus. After getting off the bus, I was sitting beside him at one of the many long banquet tables in a banquet hall. He received his PhD certificate at the ceremony being held there. The most interesting part about this dream however, was that as I was waking up, I could still feel my soul "settling down" into the weightedness of my body. As my soul "sat down upon the base" of my body, as the two elements interfaced and came together, a multitude of brilliant sparks flew out from between them as the connection became "locked and bound." EarthLight Originals is officially open for business now. Yay! Last night, following my rune divination, I dreamt. Among my many dreams, Raven - not just a black bird in form - but specifically, Raven appeared to me in my dream. Raven identified Itself specifically in my dream as Raven. 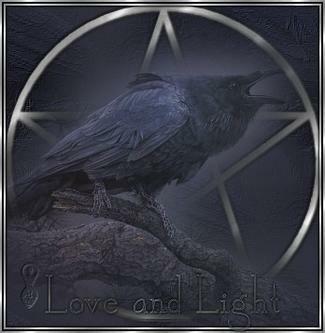 Totemic Raven activates magical energy, linking Will and Intention to make manifest great life changes and deep healing. Raven is a shaman, teacher of mysteries, guide, creator, protector, savior and a totem of deep joy. One does not choose a totem. The totem choose the person. Last night early in the wee morning hours, I drew a rune to discern the energy pattern at work in the Universe as it relates to me at this point in time. I drew Perthro, the wyrd rune whose most esoteric meaning still remains a mystery to scholars. As it pertains to divination, Perthro deals with things hidden coming to light, esoteric secrets becoming disclosed, new opportunity, retrieval of things thought lost for good, occult abilities and unexpected surprises and gains. Perthro also means vessel, the female practice of witchcraft and to dance. So, I put the "unexpected gain" to the test and did something totally out of character for me - I bought a single lottery ticket (I never buy lottery tickets) and won a small amount (less than $20). With my winnings, I bought this handmade rune cup crafted with Perthro in gold on it. 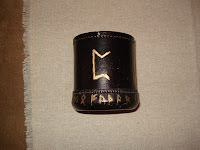 Gold runes adorn both the bottom and top of the brown leatherette cup. 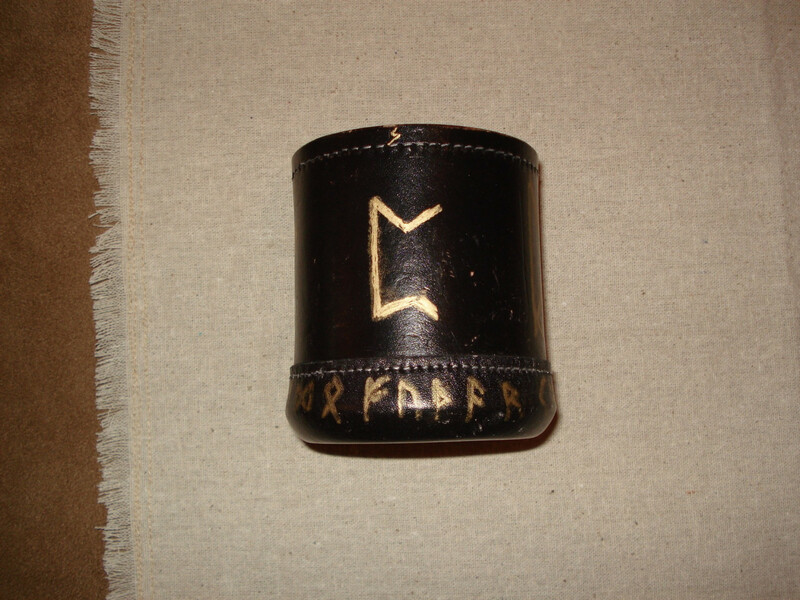 Opposite Perthro, the other side of the cup is adorned with gold Bind Runes for divination and spiritual growth. Perthro brings blessing to this period of unemployment while I look for work as I take advantage of the opportunity to develop WITCHCRAFTS and EarthLight Originals - my etsy shoppe and the shoppe my mother and I just launched (which will be stocked with our first few items by the end of this week). There was a pack of vampires, each one hunting and eating the flesh of his or her assigned victim. One after another, each vampire succeeded in it's task, and having done so, it would return to the vampire den. Satiated, the group of vampires lounged in their den discussing together their "excellent meals" of human flesh. As each one discussed his or her "meal", each victim effigy from among the effigies of all assigned victims (which had been hung from the center point of the den's ceiling like a bunch of bananas) fell lifeless to the floor. I was an assigned victim. It was night and I was being hunted by a vampiress. I sought refuge in my locked car. The vampiress couldn't get to me, so the others watching remotely from the den called to her to break the window glass. Trying to break into the car but not breaking the glass, suddenly the vampiress stopped trying and backed off. I was now the vampiress watching me through the opposite side of the car's window. She just wasn't going to do this. She wasn't going to kill me and eat my human flesh as she had been designed to do. It was against the nature of a vampire to allow me to live, but she had a choice. Even vampires have a choice - and she chose not to kill me or eat my flesh. She decided it and let me go. As the choice was complete, a flowing wall of black lava-like darkness came into view and engulfed the vampiress, returning her to her source, leaving me alive and not a victim. Commentary on Shoftim from Garden of the Dark Moon Jubilee - Dangerous Mind. Through the night of August 12 (this Thursday) and the morning of August 13 (this Friday) the Perseids meteor shower peaks, producing up to 60 meteors per hour. Look to the northeast after midnight and you may see a spectacular light show! The Perseids meteor shower is visible to the naked eye annually in late summer from roughly July 23 through August 22, depending on weather conditions and your location on the earth. The source of the meteor shower is debris from the comet Swift-Tuttle. As the earth passes through the comet's debris cloud, earth is treated to multitude of falling stars traveling at 71 kilometers per second. Though the lights are bright, each falling star is typically no bigger than a grain of sand. This year, the slender waxing crescent moon sets early in the evening, leaving the sky deeply dark for good visibility in clear weather. The wee hours before dawn is the best time to see persistent trains from the falling stars. My mother and I are going into business together selling handcrafted original recipe ecofriendly natural perfumes, lotions, salves, and other personal care and alternative medicinal products (both my biochemistry degree and professional nursing experience will come in handy here to provide scientific support for any herbal remedies we may offer). We've agreed on a name for our joint business venture - EarthLight Originals. We've ordered some supplies with which to handcraft small samples of our first two products (including a double boiler dedicated to our shoppe work) and established our etsy and email addresses. This week, in between sending out resumes, I'll be working on creating an artsy banner for our new joint shoppe. Mom will create package product labels from the banner we choose to go with. We've repurposed a cute antique cabinet in the dining room to hold our initial supplies. We're both really excited about doing this. It's fun work! Everything we make with be handcrafted with love. Last night I dreamt a complex dream in three parts. First, a small group of men were fixing a train track. One man standing on the track leaned over and made the final repair to the track, then indicated to another man to wait to turn on the electricity which powered the track until he himself got off the metal of the track and out of the way. He didn't want to be electrocuted when the juice moved through. The man on the track moved away from it, and the others turned on the power. A fast moving train came into view, slowed it's speed as it approached, and rolled with weight over the place where the track had been repaired. The repair held. The train continued to slow and then stopped, it's front engine car coming to a rest right in front of me. [Never before in a dream, has a train ever stopped benignly in front of me. Usually, I'm trying to avoid being run over or smashed by one, but in this dream, the train stopped smoothly at my feet.] Something was ready now. Second, a really odd dream inclusion - there was a ship constructed of a blend of things I had made which included snake essence (see here and here). The snake was a dangerous ingredient which kept growing, but I cut the two ends of it as they would poke out windows of the ship like growing hairs, keeping the whole blend in perfect balance. Third, suddenly, I was standing on the sidewalk outside (where I am currently living) with someone I had been paired with. We were to go on a very dangerous journey to someplace few knew about and from which few had ever returned alive. It was another test. Most thought we would be killed during this test, but without a doubt I knew we wouldn't be. This place to where we were to journey and return (proving our survival to those sending us) lay beyond the hedgerow fence and the plain fence at the edge of the property of my home. This place had a name (see below) and it was located south of our position. We were sent and told not to stop until we got there. At some point in the distant past I had built a hidden protective nest-like hiding place along the inner side of the plain fence on the south property border near where it joined with the hedgerow fence on the west border of the property. No one knew about the hidden nest-like structure I had built there - except my companion. My companion motioned me to follow him into this protective nest for the night so that we could start our journey refreshed in the morning. I did. My companion thought we were disobeying the order of those who sent us for stopping to rest for the night in my hidden nest. I thought so too at first (but by the time I woke up and wrote of it, I understand it differently* now). The place we were journeying to had a name in my mind - it's name was ננשׂון - I visually saw these letters of the name in my dreaming mind. It was pronounced something like Nĭnasōn. The "place" we had been sent toward consisted of a group of three distinct camps beyond the fence. The leader of the first camp we would journey to might kill us if he knew my companion and I were paired - my companion told me - so my companion asked me to not to tell the leader of our relationship, but to let him think we were just traveling together - and though he didn't say it - he meant for me to tell the leader that we were like brother and sister, not companions. If the leader of that place knew we were paired companions, it might stir up trouble for us. I woke up, reminded of Abraham and Sarah's and Isaac and Rebecca's journeys to Gerar. Gerar (meaning "dragging down, grinding circularly") begins with the magical letter gimel which has a gematria of three - like the three camps which together, in my mind, are a place contrarily called ננשׂון. The shoresh of this place-name is נשׂא with a שׂ, meaning "raising, lifting, appointing, sustaining and leader." Importantly, the place in my mind has no power to stir up trouble for us. It's name is ננשׂון and not גְּרָר. See then that in this place, we are not dragged down. On the contrary, we are raised up to be leaders. Note *We were never meant to stop in גְּרָר, and we stopped when we arrived there, in ננשׂון. Commentary on Re'eh from Garden of the Dark Moon Jubilee - The Most Magnificent Dance In The Sea. Tonight I drew the twenty-third rune for my personal runerow - Kenaz, the k-rune, the torch. Kenaz is the force of controlled fire, occult female secrets, esoteric knowledge, regeneration through death or sacrifice, the ability and will to create, the ability and will to control energy and the ability and will to master the technical aspects and artistry of magic. The Universe is so in tune with what happens in my life. Importantly, this directly speaks to the magical operation I performed earlier today. So mote it be, אמן. Commentary on Eikev from Garden of the Dark Moon Jubilee - An Order To Live. I was on a snowmobile-like vehicle with others who were going on a dangerous adventure to each meet our Guardian Angel. Only the worthy would be able to safely return. The unworthy would remain stuck in the Otherworld. To go to the Place of the Guardian Angels, we were going to slide free-fall together in our snowmobile-like vehicle down from the top of the snowy mountain we were on and crash into the Great Unknown Dark Sea at the bottom of the snowy mountain. This Great Unknown Dark Sea interfaced with and joined the snowy mountain we were on with a Great Dark Mountain on the horizon (which I couldn't see at this point). Naturally and complainingly, I thought "I am just too old to crash down this snowy mountain into the sea. I could break a bone or something. I'd rather not do this." But, I didn't have a choice now because we were all already on the snowmobile-like vehicle and on our way. So, since it was inevitable that I had to do this now and couldn't not do it, I thought "I hope these are nice angels." The guide in the group on the snowmobile-like vehicle said to me "no, Ma'am, they are not." "Oh, that's just Great," I naturally and complainingly thought, "I'm going to meet not-nice angels in a Place from which I may or may not return. Just Great." I wasn't fearful at all, but I did have to pee. I was going to have to wait until we got back now. Our vehicle sped down and crashed into the Great Unknown Dark Sea. After recovering from the disorientation of the crash, I reoriented myself and found myself on the Seabed under the Great Unknown Dark Sea. It was dark and shadowy for sure, but despite that, I could still see forms of the things there. I could see through the Darkness. The vehicle I arrived in was crashed around me. The only other person who remained standing in the vehicle with me was another young woman (young, like I was in this Place), except that she was made of the same Darkness as the Place we were in. I looked up ahead at the Great Dark Mountain on the horizon opposite the snowy mountain from which we had come. It ran the entire length of the horizon like a black shadowy silhouette. Its dark ragged top reminded me of the surface of bloodroot roots (like the specimen I have included in my Snake Oil). I looked forward and to my left, toward a Great Staircase which led from the Underworld to the World of the Living. The entrance to the Great Staircase was guarded by two forms which reminded me of Anubis, only they were whitish-like in comparison to the Darkness of the Place and even though they too were dark of form. One Anubis-like guardian angel-creature stood at each side of the Great Staircase with its arms folded across its chest - they stood like Osiride Pillars. The Great Staircase had a handrail running down and up the center of it, dividing the Great Staircase into one side for going up and one side for going down. I wondered if these staircase guardians would let us onto the Great Staircase leading back up into the Land of the Living. I said to the dark young woman with me still inside the crashed vehicle, "if we are going to make it out of here, we are going to have to go together." We joined hands. Holding hands, we got out of the relative safety of the crashed vehicle together and stepped into the shadowy Darkness of the Great Sea. As we were walking together toward the entrance of the Great Staircase and toward the Guardians, my spirit friend suddenly pulled me aside, toward the area left of the Great Staircase, and toward the area hidden behind the Great Staircase toward the bathrooms. We told the Guardians we were going to go to the bathroom first, before coming before them to ask permission to enter the Great Staircase. So, they didn't stop us from going behind the Great Staircase to where the bathrooms were - to go to the bathroom there (which like eating faery food in the Otherworld, would prevent us from leaving). The Guardians then got an inkling of our plan and started to move toward us (now standing under the right side of the Great Staircase). "Uh-oh!" I thought. My spirit friend exclaimed, "oh! we have to go back to the bathroom and wash our hands now," trying to trick the Guardians once again, and as if her words would ward off the Guardians in their approach toward us to investigate just exactly what we little she-devils were up to. "There's pee here!" she exclaimed and pointed toward the floor for the Guardians to see, although I didn't see any there at all. "There's pee!" she exclaimed, "we have to go back to the bathroom now and wash our hands first." The Guardians weren't fooled by her exclamations that we were going to go back to the bathroom to wash our hands first. They knew we weren't really going to go to the bathroom there. We little upstarts were trying to sneak onto the Great Staircase leading back into the Land of the Living, they knew it. The Guardians kept coming toward us. My spirit friend's exclamations then became like a magic command drawing me to awaken, "Pee! Pee! Pee!" I woke up. Of course, I had to go to the bathroom. And I went to the bathroom, here in the Land of the Living. My body and my personal Guardian Angel together had commanded me to return to the Land of the Living. 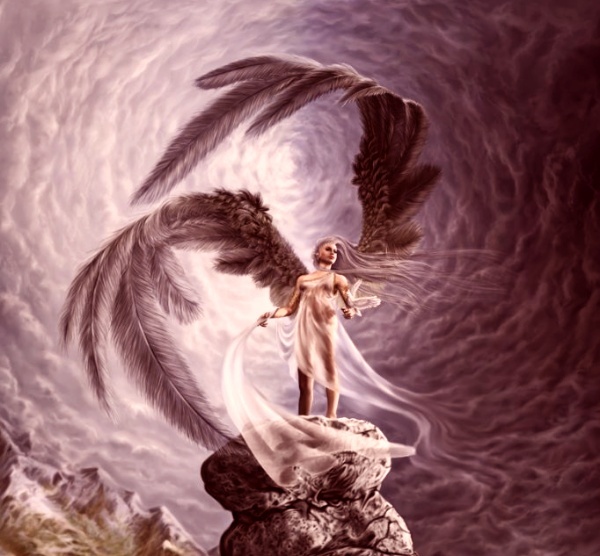 Such a funny journey into the Otherworld, but nevertheless, I returned to my body with my Guardian Angel joined in tow. Another interesting link to my herbal magic - in addition to the resemblance of the top of the Great Dark Mountain to the bloodroot in my Snake Oil (I have my own bottle too), last night before going to bed, I had ordered some certified organic earth kosher Calamus Root to try it out as an antifatigue and overall health medicine (as the Cree use it). Calamus Root is found in the recipe sourced in Exodus for the Abramelin operation which "facilitates contacting one's Guardian Angel." Wow, potent stuff - just placing the order for it worked magic! Bloodroot and Calamus Root - I think I now have some "totem" roots! I'm updating my resume as I often do to include and track my professional accomplishments. My full updated resume can be found here. This information was added to it to keep my resume current. 1. Drove percentage of high-paying Extensive Services + Rehab Medicare-A RUG levels from 38.7% to 71.1% (an extraordinary increase of 83%) during the first full quarter of my employment (Q2 2010) as MDSC Medicare Specialist in comparison to the first full quarter (Q4 2009) prior to my employment, with proof documentation obtained and in place to validate the increase as real and ethical and to support reimbursement levels. 2. Drove total Medicare-A reimbursements for my facility up 40.2% during the first full quarter of my employment (Q2 2010) in comparison to the first full quarter prior to my employment (Q4 2009). 3. Developed an automated nursing care plan templates library for over 106 acute medical conditions. 1. American Association of Nurse Assessment Coordinators (AANAC). 1. Scheduled to attend in August "Navigating the Perfect Storm: Strategies for RUGS IV" offered through AANAC on developing Medicare reimbursement strategies under RUGS IV. 2. Currently attending 9-Session Training Series "MDS 3.0 - Your Path To Successful Implementation" offered through Life Services Network (1.5 CEU each session). 3. Attended 3-day MDS 3.0 RAC-CT certification training through AANAC (22.5 CEU). Commentary on Vaetchanan from Garden of the Dark Moon Jubilee - The Goddess Tree. I was observing a highly secret experiment which had been conducted by two experimental physicists - the time seemed to be in the 1970's. The experiment involved discovering and "drilling down" into the very most basic structure of reality, into what "existed" before spacetime began. There were two towers side by side which, when turned on, were like perpetual motion high-energy machines which "perpetually moved" spacetime back upon itself. One of the two physicists turned on the towers. The one on the left (as I faced them) worked as it was supposed to - standing immovable and strong as it moved spacetime perpetually. The one on the right spun seemingly out of control and started to collapse and crash spacetime. As it collapsed spacetime, I "saw" all of human history and existence start to crumble and crash - all of existence and history was combined and represented in the form of a collapsing skyscraper - I even saw people fall off the skyscraper into a spiraling nothingness - one person was a fireman, one was a policeman. I didn't fall, but watched it as a pure objective disembodied all-encompassing observer. The information came into my mind then that the second experimental physicist (of the team of two scientists) which I had not seen earlier had died before completing his work - this is part of the reason the experiment had gone haywire. His name was Johnny. I saw Johnny - he was a young man in his late twenties or early thirties perhaps - and he had longish ponytail. He had been shot and murdered as a customer during the robbery (or terrorist attack) on a retail pharmacy store. I had the feeling this had not occurred in the USA, but abroad in Europe somewhere (Johnny seemed to be an American who was temporarily in Europe at the time of his murder). At this point, I felt I was actually channeling Johnny's spirit, who was "telling me his story" and leading me on into the next part of the dream. Suddenly, everything disappeared and there was nothing. I was purely observing from a "place" before spacetime began - back beyond and before reality was created. All of reality had crashed into nothing. There was nothing - not even me. There was only my observance of nothing and the feeling of not being alone there (yet being simultaneously all there was) that "existed." Suddenly (and these words are insufficient), there was a bluish grey essence consisting of two places in the wholeness interacting and coming together in a new way - and fixing itself. The thought accompanying this perception was that reality was being recreated. Reality had crashed beyond its beginning and was now fixing itself at the level of its essence. The bluish grey perception also reminded me of the "virtual innards" of a computer. It evoked a quiet profoundness and beauty "from me" as I observed - I also realized that I was participating in the thing I was observing - I was the essence I observed even as I observed it working. Interestingly, yesterday evening before I had this dream, my computer had crashed after I had turned it on after coming home from work - but just after the screen turned blue and the "crash" message came on - the computer went into an automatic algorithm and fixed itself! It's fine today. The computer systems at work crashed at work today also, and were down for at least two hours. They were still not working when I left at 6:00 PM, but IT had communicated to staff that they were working on restoring the computer systems and they should be back up and fixed by morning. I just had to chuckle at the chutzpah of the ritual when I read this Foxnews article. American atheists lined up to be "de-baptized" in a ritual using a hair dryer, according to a report Friday on U.S. late-night news program "Nightline." Leading atheist Edwin Kagin blasted his fellow non-believers with the hair dryer to symbolically dry up the holy water sprinkled on their heads in days past. The styling tool was emblazoned with a label reading "Reason and Truth." Kagin believes parents are wrong to baptize their children before they are able to make their own choices, even slamming some religious eduction as "child abuse." He said the blast of hot air was a way for adults to undo what their parents had done. This is my beautiful handcrafted 13 inch corn dolly. She'll grace my altar over the upcoming harvest, winter and spring sabbats, beginning with Lughnasadh. 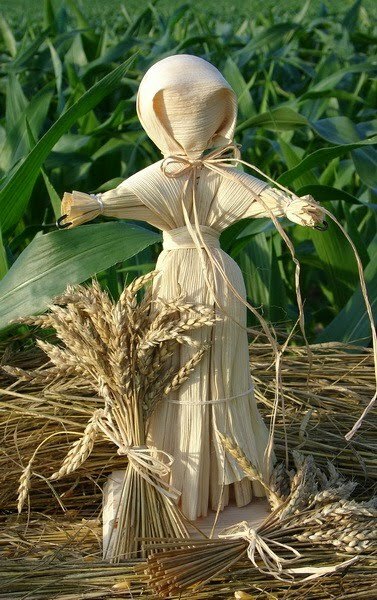 Traditionally, corn dollies are ritually enlivened during the first harvest of the season with the Spirit of Abundance. Honored on one's altar over the dark months, she safeguards new abundance for the next harvest. I have a little witch hat for her too! Commentary on Devarim from Garden of the Dark Moon Jubilee - Witch Words. I'm giddy with delight - the huge (4 x 3 x 1.75 inches) specimen of genuine black jet (also known as witch's amber) I acquired from a Yachaq Shaman of Imbabura arrived today! It was waiting for me when I got home. It's gorgeous! Last night before going to bed, as per my usual procedure, I drew rune to discern and draw forth the energy of the Universe at work in my life at this particular time in the particular circumstance driving the divination. Interestingly, the rune I drew perfectly supported the entry (Linking Worlds In Conversation With The Universe) I had posted earlier that same evening. The rune I drew was the bind-rune Wunjo, the w-rune characterized by joy, hope, harmony, pleasure and delight. Significant to my earlier entry, the cosmic function of Wunjo is to strengthen links and bonds. Edred Thorsson writes in Futhark, "Wunjo is the energy that binds different fields of force together." He further writes in Runelore, "the Wunjo describes the inner, subjective feeling one attains when in a state of inner/outer harmony - with self and environment. This is an active willed harmony toward specific evolutionary goals. The Wunjo marshalls diverse but sympathetic forces and/or beings to a common purpose." The first time I have drawn Wunjo in a divination, Wunjo now becomes the twenty-second rune (including the wyrd rune) in my personal runerow.